To create a new label, expand the “Box Settings” area and click the green icon beside “Labels and Assignments.” In the window that opens, simply name your label (and optionally assign it to a box manager — more about that in the next section) and click “Add.” To assign feedback to a label, open your feedback and select the appropriate label from the drop down list. Prioritization: Assigning actionable feedback to High, Medium, and Low labels can help you work through them more effectively. Grouping by tone: While both positive and negative feedback can be equally as useful, separating them can uncover important metrics or an overall employee pulse. Grouping by business unit: If you use a single suggestion box to collect organization-wide feedback, creating a label for each business unit can be very useful when prioritizing or delegating. When creating a label, you have the option of linking it to an existing box manager. 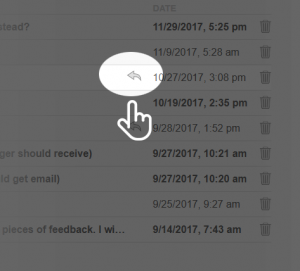 When feedback is tied to that label, the box manager receives a notification. 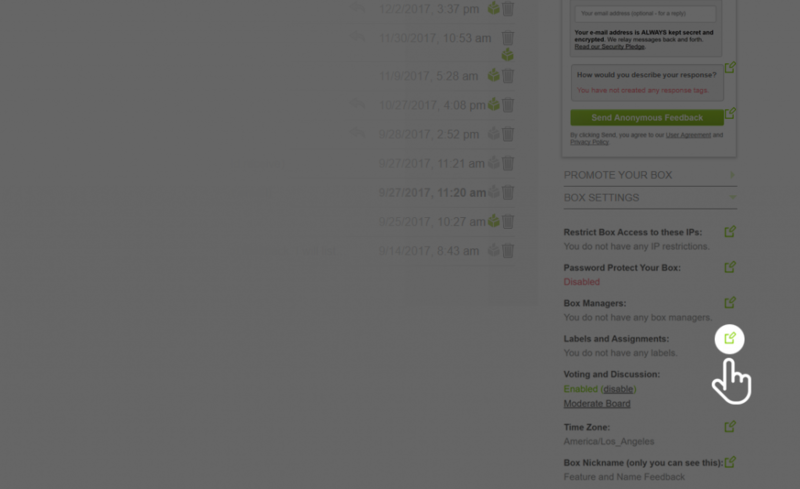 If they choose to hold an anonymous conversation, the box manager’s email addresses will display when you hover over the note (only in the dashboard, not in the respondent’s view). While not quite a ticketing system, it does allow for easy delegation and accountability. How Are Labels Different from Tags? Think of tags as a way for your respondents to self-categorize their responses. If your tags are descriptive enough, often times the chosen tag can be an important part of their feedback. Consider the following example. Let’s say you offer the following tags to your respondents: Cost Savings Idea and Employee Retention Idea. Then, an employee submits the following idea: “Offer the option of leaving early every Friday to employees who meet a goal.” Tagging that idea as a Cost Savings Idea implies that they feel the company will save money with improved efficiency throughout the week, while tagging it as an Employee Retention Idea implies the company may save money by keeping current employees happy. Both ideas may ultimately save the company money, but may need to be thought through in very different ways. For example, framing an idea as a Cost Savings Idea may spark other, cost-saving ideas, while framing it as an Employee Retention Idea turns it into an idea for HR to consider. Ultimately, tags may not categorize your responses as accurately as your labels will, but they can give you a great head start in organizing your box or analyzing the feedback. Traditionally, collecting employee feedback was limited to annual performance reviews or irregular feedback requests. Smart organizations gradually realized that employee feedback should function as an ongoing loop, ever evolving to strengthen the organization. Using a “loop” as a visual indicator helps to convey the revolving nature of employee feedback. The loop begins with the collection of candid, honest feedback, which management then analyzes and uses to develop a plan of action. Once the plan is in place, employees are encouraged to continue submitting feedback and the plan of action continues to evolve. The result is a stronger organization with happier employees, who in turn create more satisfied customers. In order for a feedback loop to continue evolving, it needs a continuous supply of honest, open feedback. Without it, action plans can become watered down, or in the worst case, never develop. As we’ve covered in another post on anonymity, employees tend to avoid negativity when providing direct feedback and are reluctant to irritate or challenge their superiors. In an article on conducting employee surveys, HBR noted that when asked to submit feedback, anonymity is the number one concern for employees. The same study shows that when employees have a guarantee of anonymity, they are more likely to submit honest, productive feedback — and even submit more of it. Incogneato plays an essential role in both closing the employee feed loop and helping it continue to revolve. As a trusted third party, Incogneato helps organizations collect anonymous employee feedback without having to worry about inadvertently storing log files or otherwise finding out the identity of an employee who wished to remain anonymous. With a trusted system in place, employees will be more likely to continue submitting the type of honest, productive feedback that keeps the feedback loop revolving. How Is Incogneato Different from Other Anonymous Suggestion Boxes? One of the key differences between Incogneato and other suggestion boxes is the ability to hold an anonymous conversation. Often times that initial piece of employee feedback leads to more questions that would otherwise go unanswered. Our Anonymous Chat feature lets you immediately ask a follow up question or for request further clarification. This one feature is key to a more effective employee feedback loop, as it helps management to more thoroughly understand the issue before an action plan is developed. If you haven’t already, give Incogneato a try by setting up a free anonymous suggestion box. No credit card is required during your trial. Before initiating an anonymous feedback program, many organizations attempt to forecast its annual value in terms of revenue saved or earned. Those who have tested anonymous feedback programs in the past have an excellent benchmark to gauge future results, but for those who have not, forecasting can be a challenge. Cost-effective and simple-to-setup solutions like Incogneato make it easy to launch a short-term test to collect data without incurring a significant expense. However, some organizations have internal policies (or preferences) that require a forecast before any program can be initiated. According to SHRM, the average cost per hire is $4,129. Another study found the cost of re-hiring a midrange position ($30-$50K per year) to be 20% of the employee’s future salary. But how do you know if you’ve actually retained an employee by addressing their anonymous complaints? Due to the nature of anonymous feedback, you cannot actually tie an individual employee to a problem solved. You can, however, look at the severity of the anonymous complaints you’ve addressed. For example, you will likely not lose an employee over unpalatable vending machine options, but if you seriously address multiple complaints about a toxic manager or co-worker, it may be reasonable to assume that you have retained an employee. The Balance Careers published a list of the top reasons employees quit their jobs. Reasons ranged from sour relationships with coworkers to a lack of autonomy on the job. For those forecasting potential results of an anonymous feedback program, it may be useful to look at past exit interview records and make a list of reasons employees cited for leaving. Then determine which employees could have been retained had you known about the issue and had a chance to fix it. Research shows that employees are more candid when their personal anonymity is guaranteed and may not share important information while still employed. Customer happiness can be a difficult metric to directly measure, but in many cases can be indirectly observed by looking at repurchasing behavior or loyalty. For organizations with customer accounts, tying initial purchases to repeat purchases is simple. Those with referral or affiliate programs have the added benefit of measuring customer evangelism (word-of-mouth marketing). Like with employee retention, you cannot tie a specific customer to their anonymous feedback, but you can look at trends while the anonymous feedback program was in place. If your repurchasing/loyalty rate jumped while you were addressing anonymous customer feedback, you may be able to assume a causal relationship. 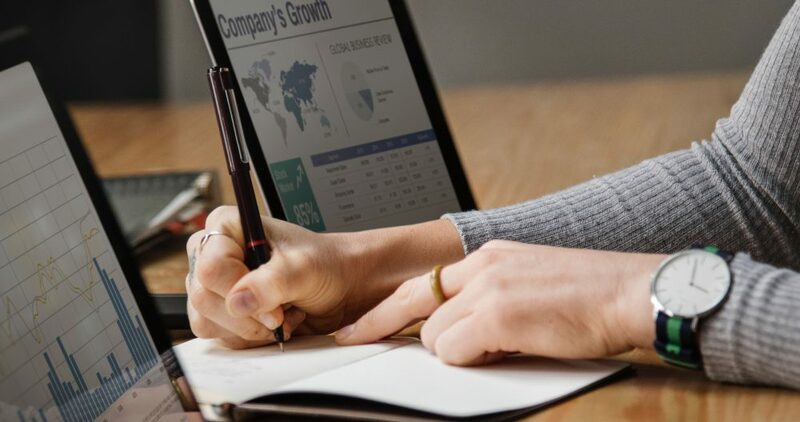 For those forecasting potential results of an anonymous feedback program, it can be useful to look at past customer retention rates over time. If they are stagnant or low for your industry, look at exit surveys you may have collected and try to determine if any issues could have been solved had you known about them. You can also reach out to past customers to ask why they moved on. Lastly, you may be able to tie organizational growth to an anonymous feedback program. It’s easy to downplay the significance of your feedback program by calling it a “simple suggestion box”, but organizations are complex entities with many inputs and outputs. 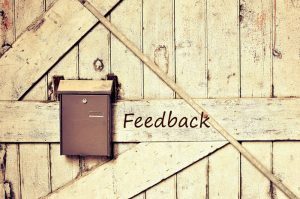 A good anonymous feedback program lets you address key customer and employee concerns or ideas in a safe, meaningful way that can have massive impacts on long-term growth. Incogneato makes it easy to collect and address anonymous feedback from employees, customers, or just about anyone else. If you haven’t already, start your free trial now. Not convinced yet? Here are five reasons to choose Incogneato for your anonymous feedback. Should You Reply to Negative Feedback? A common question asked by those collecting feedback is whether or not to respond to negative feedback. In our opinion, the answer is YES. It offers a rare path to improvement. Trolls aside, people leave negative feedback because they are trying to help. They care about your organization or about it’s potential benefits. For every person who leaves negative feedback, many more will stay silent and simply walk away. Take negative feedback seriously and use it to improve your product or service. It may even be the case that no improvements are necessary there was a simple misunderstanding. In any case, you should always reply back to the respondent. It opens an important dialogue. It can be very angering to have feedback ignored, especially if the person is already upset. A quick reply can diffuse the situation immediately and open a meaningful dialogue between you and the respondent. You might not be able to solve their problem right away, but letting them know you care is a good first step. 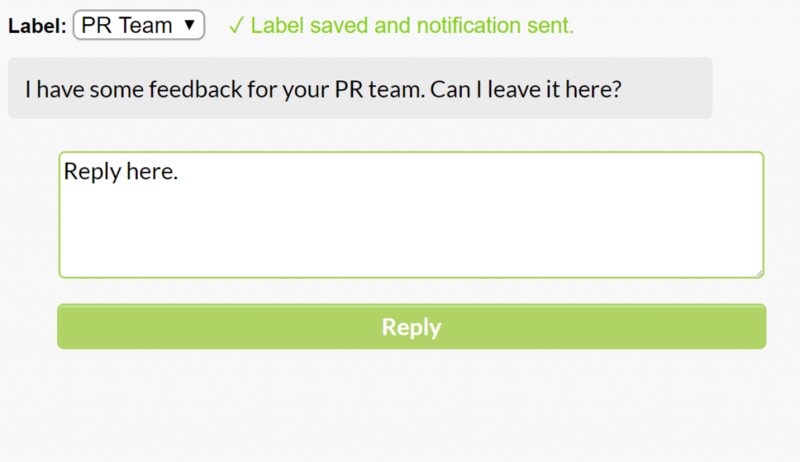 If you’re using a canned response, consider customizing it a bit by reiterating their concerns. As you work toward a solution, reply back with occasional updates or an estimated timeframe. Giving a respondent the cold shoulder signals that you don’t care enough to respond. At this point, they may take their grievance public and potentially damage your organization. A quick response only takes a minute and could save you significant trouble in the future. Before the release of Incogneato, replying to anonymous feedback was difficult, if not impossible. Incogneato solved that problem by allowing organizations to anonymously communicate with those who leave feedback. Acting as an intermediary, Incogneato relays messages back and forth, allowing the respondent to remain anonymous. Improve your organization with Incogneato. Start your free trial now. Not convinced yet? Here are five reasons to choose Incogneato for your anonymous feedback. How Can Your Organization Benefit from Anonymous Crowdsourcing? Human Resources: challenge your employees to submit and discuss ideas to improve their work environment or save money. Businesses: empower your customers to suggest and vote upon new products or services. Government: encourage your community members or internal staff to submit and discuss local improvement ideas. Product Managers: upload your new product road map and open it up to anonymous voting and discussion. Nonprofits: collaborate with your employees, community, or other organizations to further your goals. Landlords: post suggestions you’ve received from tenants for anonymous community discussion. Education: let students and parents take an active role in the classroom by anonymously discussing new learning techniques. Does Crowdsourcing Really Improve Ideas? Recent studies from both the Harvard Business Review and MIT’s Sloan Review suggest that crowdsourcing ideas is an effective and necessary exercise for companies interested in improving both their operations and knowledge base. This study suggests that crowdsourcing taps into existing company resources by leveraging the innovative power already present in employees. Sometimes all it takes is bringing people together to collaborate and share knowledge. Whether companies are providing internal crowdsourcing tools to gather suggestions from employees, or expanding beyond the bounds of their organization to source solutions from external groups, they’re acquiring new knowledge, ideas, or resources at a very small cost. Why Does It Have to Be Anonymous? When not anonymous, employees tailor their feedback to avoid irritating or challenging their superiors, which guarantees that potentially difficult or groundbreaking discussions end up watered down or withheld altogether. Other groups, like customers, students and coworkers, may also hesitate to engage in a candid discussion when they feel their words can alter or jeopardize a relationship. This desire for anonymity is well-documented in research on employee feedback. In an article on conducting employee surveys, HBR noted that when asked to submit feedback, anonymity is the number one concern for employees. When employees are certain that their feedback will remain anonymous, they are not only more likely to submit honest, productive feedback, they are likely to submit it more often. This type of environment is vital for the successful implementation of a crowdsourcing initiative. Candid, secure employees are far more likely to provide innovative insights than those worried about the consequences of alienating leadership. Incogneato’s Premier Plan offers company managers the opportunity to crowdsource ideas and feedback from employees in an open and anonymous setting. It does this by expanding upon Incogneato’s core functionality by letting managers selectively add suggestions they receive to a public voting and discussion box. The box can be both password-protected and restricted by IP address to limit access. Incogneato can help to validate employee contributions while providing the company with tangible suggestions for improving workplace culture and adjusting operations—it has the potential to bring forth truly innovative ideas from a company’s workforce. Give your organization the powerful benefit of honest employee feedback. Start your free trial now. Not convinced yet? Here are five reasons to choose Incogneato for your anonymous feedback. Today we launched a big update to Incogneato’s “Voting and Discussion” tool (Premier Plan only). In addition to a new responsive design, the tool now includes the ability to sort by tag, search within, and link directly to specific discussions. Box owners can moderate the forum by locking/unlocking discussions and deleting individual comments. Locking a discussion allows people to view past vote counts and discussions, but not contribute to it. Attracting and maintaining a talented workforce is a perennial problem for employers and one that has become especially frustrating in the past several years. Conventional incentives like competitive salaries, robust benefits packages, and spacious offices are still useful tools, but they are no longer enough for today’s office population. Recent studies by hiring industry leaders like GlassDoor.com have shown that less tangible factors, like company culture and workplace values, are vital to employee satisfaction. Corporate employees spend more time per week with their co-workers than they do with their own families, and they crave an enjoyable and nurturing environment. But what practical steps can an employer take to improve something as difficult to define as company culture? A company’s greatest source of ideas for improvement can be its employees, but soliciting these ideas can be a challenging process. Implementing tools for anonymous feedback is a fantastic way to open lines of communication with employees, and can be a huge first step for a company seeking to make changes to their workplace culture. Many company leaders feel that they can meet the needs of their employees by simply asking them what they can do better. While this might cultivate an appreciation for the leader, it is ineffective when attempting to change or create an employee-driven work culture. Why? Despite the best efforts of the leader, employees will tailor their feedback to avoid irritating or challenging him or her, which guarantees that potentially difficult or groundbreaking suggestions end up watered down or withheld altogether. But while an employee may be ambivalent about giving their opinion directly to a manager or an HR representative, that does not mean that they do not want their opinion to be heard. This Forbes round-up of studies on employee engagement suggests that finding ways for employees to thoughtfully express themselves can have across-the-board benefits for a company, including improved employee retention and increased discretionary effort on the part of employees. So while employees are hesitant to express themselves to leadership, the ability to express themselves is a vital component of employee satisfaction. Anonymous feedback tools provide a solution to this dilemma. 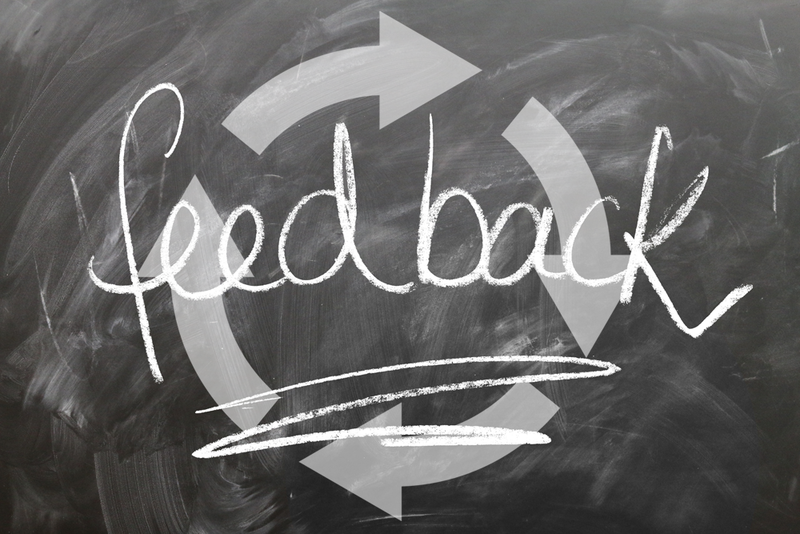 A recent article from Wharton Business School explores why anonymous feedback is such an effective tool for improving company culture – it empowers conscientious employees to bring their full capabilities to bear on improving the company, without fear of reprisal. In an article on conducting employee surveys, Harvard Business Review (HBR) specifically outlined that when asked to submit feedback, anonymity is the number one concern for employees. When employees are certain that their feedback will remain anonymous, they are not only more likely to submit honest, productive feedback, they are likely to submit it more often. 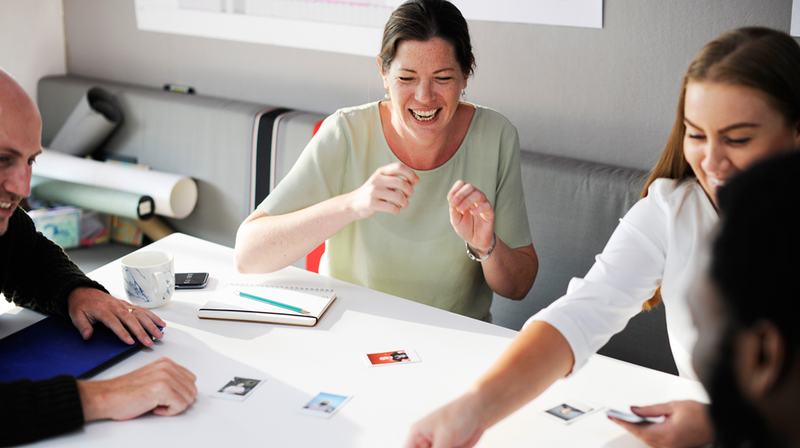 This is the type of positive communication cycle that can quickly help employers take an employee-driven approach to improving workplace culture. When implementing an employee feedback program, employees want to know that their voice has been heard. This does not mean that every piece of feedback submitted has to end with reform, but employees need to know their concerns are at least under consideration. A publication by the Society for Organizational and Industrial Psychology explains that the role of HR managers is vital in this process. The HR manager’s role has shifted over the past few decades from a position that is concerned only with the needs of individual personnel, to a position that is concerned with a company’s well-being as a whole. A large part of this role is analyzing, implementing and leading changes that affect the company’s culture. For many companies, this is the position that will be responsible for generating and responding to employee feedback. The importance of Human Resources’ role in facilitating a comfortable and engaging workplace culture was discussed in a study published in the International Journal of Economics and Financial Issues. This study showed that HR has to maintain a state of constant evolution in its relationships with employees. When HR creates changes based on the feedback that has been provided through open dialogue with employees, the employees, in turn, feel a stronger relationship with the company and are more likely to continue their position with the company long term. 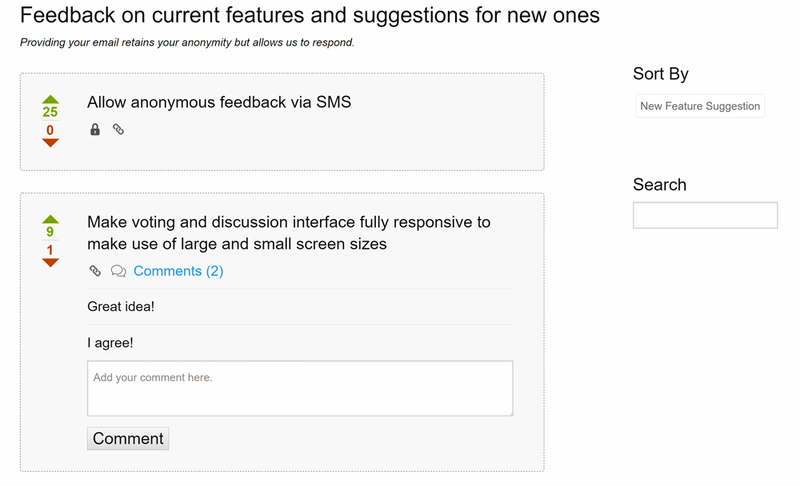 Anonymous feedback tools are a great method for facilitating that type of communication. Incogneato is an online tool that allows for open, anonymous communication between employees and company representatives, particularly the HR department. Incogneato not only allows employees to provide their opinions, but it allows for real-time chatting with company representatives, which evolves the feedback process from a tedious back-and-forth to a constructive conversation. Because Incogneato opens anonymous, real-time communication avenues between employers and employees, it validates the employee’s contribution while providing the company with tangible suggestions for improving workplace culture. As illustrated above, the benefits to this mode of communication are plentiful, and its implementation is exceedingly simple. Incogneato offers a chance to improve communication and culture at companies of every size. Give your company the powerful benefit of honest employee feedback. Start your free trial now. Not convinced yet? 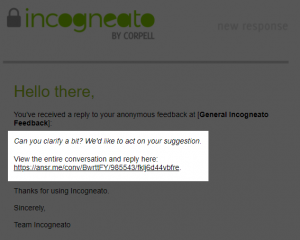 Here are five reasons to choose Incogneato for your anonymous feedback. It’s amazing what some charge for an anonymous suggestion box. We work with organizations of all size, so we have to keep our prices within reach of everyone. That’s why plans start at just $9 per month. 2: We’re a trusted third party. When collecting anonymous feedback, it’s important for your respondents to feel comfortable. Collecting anonymous feedback on your own server can make employees feel exposed and vulnerable. Even with the best intentions, you may inadvertently store log files that could later identify your respondents. Unless they choose to identify themselves, Incogneato keeps your respondents anonymous. 3: We’re the only one with anonymous chat. 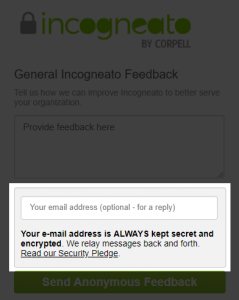 One of Incogneato’s key features is the ability to hold an anonymous conversation. Often times that initial anonymous suggestion leads to more questions that would otherwise go unanswered. Anonymous chat lets you immediately ask a follow up question or for clarification. 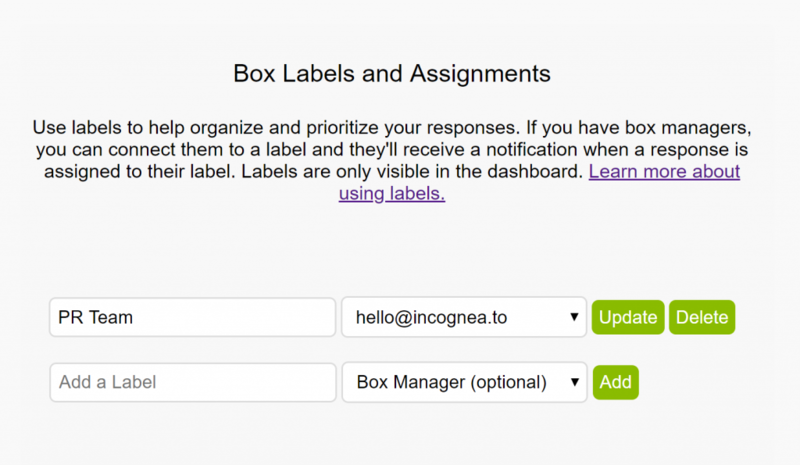 4: We let you customize your box to fit your organization. It’s important for your employees to recognize your brand when leaving feedback. That’s why we include lots of ways to customize your box including a your logo, a custom URL, and an introduction paragraph. 5: We take anonymity seriously. While other suggestion boxes offer the option to stay anonymous, Incogneato is always anonymous because we believe strongly that anonymity breeds honesty. And there’s research to back it up. The Harvard Business Review found that respondents are much more likely participate in a survey if their anonymity is guaranteed. We also take privacy and security seriously. In addition to using 256-bit SSL encryption for all communication, we also do not retain any personal identifying information of the person leaving a suggestion, other than an encrypted email address (if they choose to include one). So you’ve setup your suggestion box and are starting to receive some great feedback. While much of it is helpful, some suggestions are vague and need more clarification. That’s where Incogneato shines. All Incogneato plans come with a unique message relay system that lets you anonymously chat with your respondents, either via email or in real-time. 1) When leaving a suggestion, your respondent has the option of including their email address. We encrypt it and never share it with you. 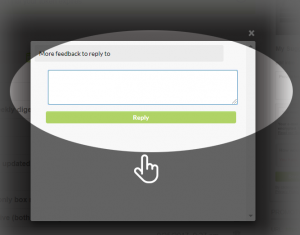 2) If your respondent included an email address, you’ll see a reply arrow beside the suggestion in your dashboard. Simply click the arrow to reply. 3) When you reply, your respondent will receive an email with your reply text and a link to continue the conversation. 4) If you’re logged in to your dashboard, you’ll hear a notification chime when someone replies so you can continue the conversation live in real-time. If you haven’t already, test out this unique feature by creating a free trial account. It’s free for 30 days and no credit card is required. Not convinced yet? Here are five reasons to choose Incogneato for your anonymous feedback. Can Incogneato Help Retain Your Employees? Communicating with your employees is the first step in retaining them. 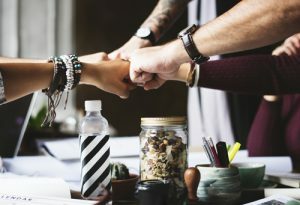 According to Gallup’s 2013 “State of the American Workplace” report, engaged employees make strong contributions and are more connected to their organization. While some may candidly share their views during a face-to-face conversation, we believe that anonymity is better for sensitive issues. This is especially true if the employee fears retaliation or being ostracized. For example, an organization with a strong hierarchical power structure might be less open to feedback from those at the bottom. Even a flat organization may have employees who would rather remain isolated than share their ideas face-to-face. While there may be little you can do to retain an employee experiencing personal issues, employees can also use an anonymous feedback tool to disclose workplace issues or tell you why they are dissatisfied in general. Plus, giving your employees a real outlet to improve their work life can make all the difference for those experiencing difficulties at home. Even if change is not possible at the moment, you can use Incogneato’s anonymous communication feature to explain your position or discuss alternatives. If you haven’t already, give Incogneato a try by setting up a free anonymous suggestion box. No credit card is required during your trial. Not convinced yet? Here are five reasons to choose Incogneato for your anonymous feedback.